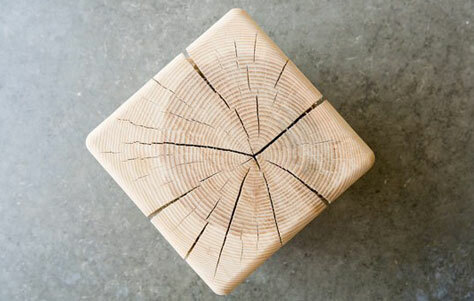 A recent post on 3rings showcasing a new twist on tree stump furniture got me exploring. I have been excited by the simple smoothly sanded stumps for sometime. I love the addition of the geometric square and triangle shapes in this design because tree stumps are universally so round. 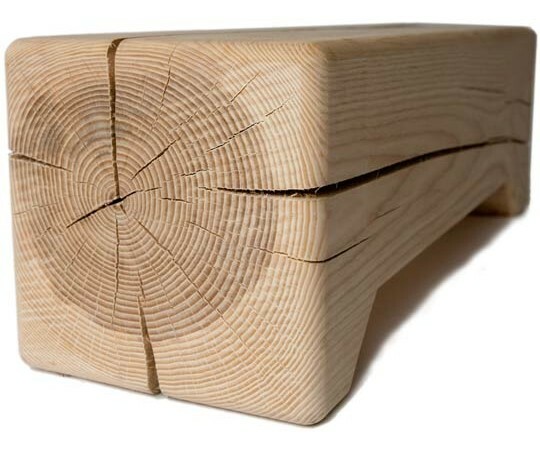 One of things I love about this simple furniture solution is the history that is visible in the tree rings. Every tree tells a story of nature and time by looking at the growth rings. I also love the random universal checking as the log dries and splits. It is all so very natural. Stump is from Kalon Studios. The website states that they are based in Los Angles, CA and Berlin, Germany but all the products are made in New England. 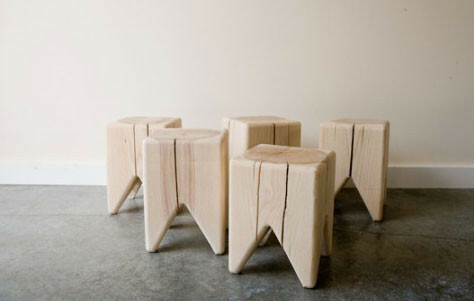 They describe Stump as follows: "Stump is inspired by the original sitting stool: a tree stump. Raw. Unfinished. The piece celebrates the natural qualities of the tree trunk. Stump is cut from the green wood of a tree trunk so the surface splits as it ages and dries, giving each piece a unique look. FSC Certified domestic Ash or Maple (depending on availability), sanded to a smooth finish. 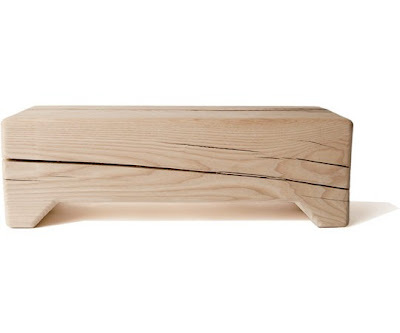 Pairs with Trunk (footstool or bench)." And here is the bench made from the trunk - more than the stump. I have been wanting to make a stump table for a long time. This post might just be enough to inspire me to get going. I will have to acquire a power sander though! Maybe this would be good use for some of the trees that came down during Hurricane Irene. I'll need to be patient though. Tree damaged was relatively minor here but we did lose two large ash trees. Only their tops were snapped off and they are hung up high in the tree canopy. I'll let them weather up there for a year or so, or until they drop to the ground for safe cutting! In any case, it has gotten me exploring stump tables. More to follow! Maybe the stump table should make it's home in the grove down stream from the bridge. Sounds like a great project for a sculpture week.